Such applications can be used for Xbox® or PS3™ gaming consoles. By setting up Single Port Forwarding, your gaming consoles will have access to the Internet and game servers since this feature allows the router to open specific ports all the time to let requests from a computer in your network to pass through the Internet, and vice versa without any issues. For you to configure such settings on your router, you must retrieve certain port numbers exclusively assigned to your gaming console. You may contact the console’s manufacturer or refer to your Xbox gaming console’s documentation for its specific port numbers. This article will give you instructions on how to set up Single Port Forwarding on Linksys Wi-Fi Routers and Linksys Smart Wi-Fi Routers. Single Port Forwarding will only allow you to specify one (1) port for forwarding. 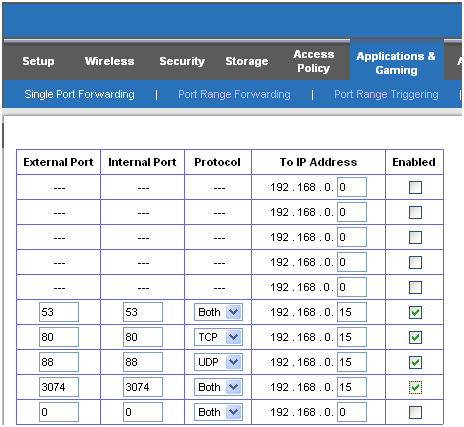 If you want to forward multiple ports, you may perform Port Range Forwarding. Click here for instructions. NOTE: If you want to set up Single Port Forwarding through your Linksys cloud account, click here to learn how. The service ports that you need to forward on the router differ on the type of Internet service you’d like to access. Refer to your documentation or contact your console's manufacturer for details. NOTE: In this example, we'll be forwarding ports for Xbox 360 to access Xbox LIVE® services. See your gaming documentation or contact the console manufacturer for any service port specification of your game. Access your Linksys router’s web-based setup page through Linksys Connect. For instructions, click here. If you’re using a Mac® computer, navigate to the Applications folder in Go, and then start Linksys Connect. For detailed instructions, click here. Click on the Applications & Gaming tab. NOTE: For assistance on setting up a static IP Address on your Xbox 360, contact Xbox support. 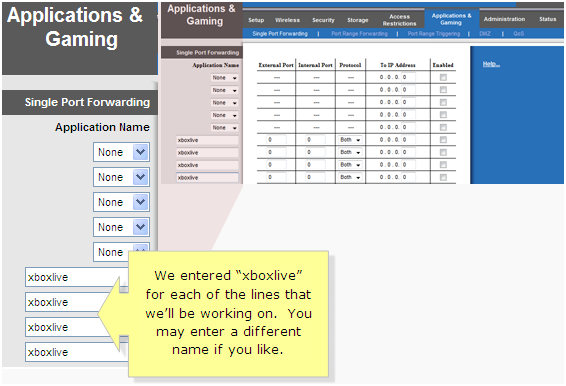 Under Application Name, enter “xboxlive” for each of the lines that you’ll be working on. You may enter a different name if you like. NOTE: In this example, a total of four (4) “xboxlive” lines were entered. Complete the rest of the entries for each field. Start by entering each unique port number inside the allocated fields under the External Port column. Proceed by repeating the same port numbers under the Internal Port column. NOTE: An error message notification shown below will appear if the port numbers you entered are out of range. Make sure that the port numbers you enter are within the range of 0 – 65535. Under the Protocol column, be sure to select the correct protocol for each line. Under the To IP Address column, enter the IP Address of your Xbox 360. In this example, 192.168.0.15 is the IP Address of the Xbox 360®. Therefore, 15 is the value we need to enter for each line. Under the Enabled column, make sure that each box is checked. NOTE: Adding of ports to be forwarded is only limited to the space allotted on the page. After completing all the necessary entries, click . Once your changes have been saved, a confirmation screen should appear. Click on the Continue button to return to the previous page. NOTE: If you’re having issues with the Network Address Translation (NAT) type of your gaming device, click here for troubleshooting instructions. Single Port Forwarding enables you to open various network features of your router and expand your connected home. A good example would be adding an IP camera. If you want to access your device remotely (camera, FTP, etc. ), enter the current Internet IP / static IP Address of your remote server. You should be able to access your remote device/server when this is done.